We follow the fortunes of the Eade family over seven and a half centuries as, with an eye for the main chance, they attempt to climb the ladder of prosperity by constructing, amassing and then protecting their land holdings over the centuries while diversifying into trades such as bricklaying and stonemasonry. From 13th century Chiddingfold in Surrey they spilled over the adjacent county border into West Sussex around Northchapel and Lurgashall and then into Bramshott and Headley in Hampshire via the Sussex settlement of Linchmere, relentlessly pursuing their aspirations. When all of this eventually began to unravel in the Hampshire village of Hawkley at the end of the 18th century, family fortunes stuttered on for a while with a Market Garden Business located in Petersfield. However it was courtesy of the empire's Armed Forces that poverty was staved off and Eades visited much of the globe then marked pink. The available records provide a fascinating glimpse into past times throughout the centuries where events such as the plague, diseases, war and market downturns make their indelible mark on a family line that survives to this day. Much of the research for this particular branch of the Eade family has been done by the authors themselves and in so doing has provided many interesting, satisfying, funny, sad and ultimately very moving moments. However, by any stretch of the imagination, this could not be done alone and invaluable assistance was provided by individuals that staff the county archive and record offices at Winchester, Chichester and Woking, without whose direct help and assistance much information would have remained uncovered. These three archives proved to be the source for much of the material used within this book covering, as they do, the respective counties of Hampshire, Sussex and Surrey. In addition to these repositories The London Metropolitan Archives, whose records also encompass part of Surrey, went to the unprecedented lengths of restoring a vital will of 1568 vintage in order to make the document available for research. An equally important marriage license of the early 18th Century which had been tagged as unavailable due to its general condition was likewise produced for inspection. The Public Records Office at Kew in turn provided records of some antiquity and great interest where once again the help and assistance of staff proved invaluable to piecing this story together. All of this, of course, bodes well for those striking out with a newly-found interest in tracing their family's roots. The local museums located in the towns of Haslemere and Godalming, both in the county of Surrey, were incredibly rich sources of information, the former holding the works of Chiddingfold's historian, the Reverend T.S. Cooper, with Godalming Museum the current resting place of the encyclopaedic works of Percy Woods. It is very difficult to describe and fully acknowledge the way that volunteers and archivists at places such as these simply 'bend over backwards' to provide so much help and assistance. To single out individuals for their forbearance is of course quite wrong but mention must be made of Shirley Dixon at Godalming and Greta Turner at Haslemere for all of their kind assistance. Indeed our gratitude towards Mrs. Turner probably knows no bounds as the information that she provided by way of her own private work on the Manorial Records of Linchmere in Sussex quite improbably bridged that huge gap by the name of the 17th Century in stunning detail and consequently made this book possible. Generosity on this scale is a thing of marvel and can never be repaid. John Owen Smith's marvellous website for the parish of Headley in Hampshire came to the fore as home to an extensive 'Eade' family well before any links were actually proved. Upon discovery of so much copious and detailed information it prompted the comment that "wouldn't it be marvellous if our family came from here," they did and it certainly was! It was through this site that contact was first made with Jennette Gest, a 'cousin' in Australia who had already completed an in-depth work on the family during the 19th Century, much of which is contained in the following pages. Why such people take so much time, trouble and interest to supply such invaluable information to the world in general is known only unto themselves. Thanks must also be made to those who opened up their homes, which at one time or another had been occupied by Eade family members, in such a welcoming and interested manner. Marilyn Metcalfe at Hollywater and Colonel Baker at Rovehurst are two who are singled out amongst a number of others in various locations at Chiddingfold, Linchmere and Hollywater. A number of Eade family descendents were inevitably and somewhat excitingly contacted throughout this research and who in turn have supplied detailed events which are recorded within. The final mention is reserved for Sara Eade who holds a huge amount of records that concern all aspects of the Eade family worldwide. Although in the end there proved to be no known family ties between the subjects of this history and Sara, she supplied abundant vital information that knitted together much of the past 150 years. That it was possible to devote the past years to producing this history of our family was in no small part due to our respective spouses Becky and Ken who for most of the time at least retained their sense of humour and at other times actively encouraged and joined in the research. The story within this book commences with a fairly interesting but unremarkable family of mainly yeoman farmers that nonetheless spanned the passage of 550 years from the middle of the 13th to the close of the 18th Century. It is quite possible that they had originated in Normandy and sallied forth across the channel for their particular date with destiny and that famous 'set to' with the Saxon King Harold in 1066, as it appears that five knights carried the same family name of Eude. The most famous of these was of course Bishop Odo who was half brother to William himself and coincidently held land around Godalming, an area pivotal to this book. The French spelling of this 'club wielding bishop' was "Eude," or "Eude Eveque de Bayeux" to be exact. The bishop's namesakes and fellow travellers were Eude Comte de Champagne, Eude le Flamand, Eude de Fourneaux, Eude le Senechal (le Sinichal) and lastly Eude Cul de Louf. This latter name, like so many, was probably a nickname that possibly referred to some shortcomings with his digestive system. This family name was applied to a number of 13th Century family documents that included some spelling variants such as "Hude" "Oede" and "Ude," names that nonetheless varied only a little in pronunciation. However, whether the family were a minor branch of one of these individuals or merely associated with them in some way would require further research, presuming it were possible to prove at all. Regardless of from whence they had originated, the 'Eades' had settled around the Surrey village of Chiddingfold by the middle of the 13th Century where they held various small tracts of land at nearby White Beech and Pockford. Here their landholdings surrounded a dwelling that was referred to in 1337 as "a mansion called Udes." A local historian, the Reverend T.S. Cooper, has interestingly traced the probable location of this particular dwelling. The land around White Beech and Pockford is generally poor, not only consisting of clay but also sloping downward to the streams that criss-cross the area. Although now heavily wooded, the field boundaries in use by the family at that time are still partially evident, as is the route of the lane that serviced them. Although better placed than most, survival for the 'Eudes' must have been a daily grind. Not long after this beginning, the family faced the horrors of the Black Death and the immense changes to medieval society and structure that followed in its wake. It is quite evident from the records that it took many years for family numbers to recover and for family landholdings to begin increasing once again, notably this surge would only happen some 150 years after the Great Pestilence had wrought its havoc. Throughout this entire period the "Edes," as they were then known, remained in occupation of the same holdings at White Beech and Pockford, thus confirming their continuing line from the 13th Century onwards into the late medieval period. By that time the family had secured further tracts of land around Chiddingfold which included holdings by the names of Southneys, Combe, Cherfold, Killinghurst and finally Rovehurst, tenure of which are confirmed by Manorial Records, Property Deeds and Lay Subsidy Rolls of that period. Here, the family's fortunes fluctuated over time but they remained or, more accurately, dallied around Chiddingfold for a further 200 years. Slightly to the south of that village the same Edes family doubtless expanded and flourished within the parishes of North Chapel, Lurgashall and Kirdford in the county of Sussex where they remained farming until the dawn of the 20th Century. 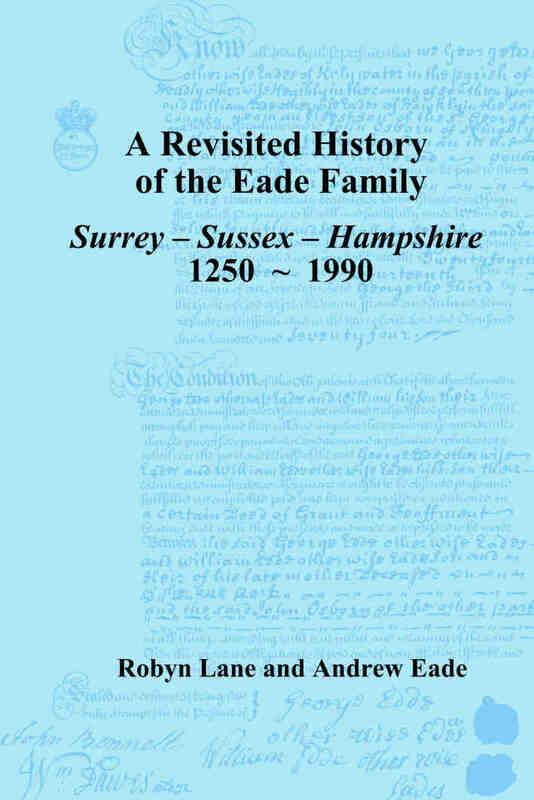 However, the Ede family line followed by this book had, by the year 1600, settled a handful of miles to the north of Chiddingfold at the village of Hambledon. It was from here that the tenure of a 285 acre holding at Munstead was secured, a place occupied by the family for 50 years, and the place from whence the eldest son departed to settle in the Sussex hamlet of Linchmere. They remained domiciled at Linchmere until the end of that unhappy century, which had been torn asunder by the ravages of the English Civil Wars, until circumstances divested them of their lands and livelihood during the 1690's. Their resulting migration took them over the county border and into Hampshire where they settled Passfield and Hollywater in Bramshott and Headley Parishes, once again occupying significant parcels of land. During 1701 the first mention would also be made of the ancillary trade of stone masonry, which would deliver many family members of a significant income and standing in their community. They remained around Bramshott and Headley in one form or another for 180 years, in the process giving rise to a full gambit of family feuds, questionable Wills, litigation, mortgages, jail, and hard times. They also established 'Edes Builders' at Headley during the final quarter of the 18th Century, a venture that finally ran out of steam around 1810. While the builders were in full flow, the branch followed here had cast aside that part of the county and gravitated to the Hampshire village of Hawkley where death and destitution occurred in 1802, taking with it the last of a long line of Yeoman Framers. Following this demise the family re-emerge, complete with a non-conformist streak, in the nearby town of Petersfield where they are once again found demonstrating an entrepreneurial spirit by way of a market garden business in that town. It was at this time that the spelling of the family name was finally fixed as "Eade" and a point at which this book fundamentally changes as, along with most of the population, the Eades were dragged along by the Industrial Revolution and forced to leave their old ways and customs far behind them. However, this change did not consign the family into the mass of mundane records of the Victorian period but provided a further riot of information that provides the slightest of glimpses into the contradictory world of poverty, hardship and squalor which accompanied empire and Great Britain's role as world policeman. As the Victorian era transformed into the Edwardian and Georgian periods, the 1914-1918 war exacted a terrible cost on the extended Eade family as, with many families, the horror and dying continued long after that terrible war had ceased. A list of known family members who played their part in that awful conflict lies at the front of this book which is dedicated to their memory and courage. The post war depression inevitably makes its mark as does the second world conflict that followed hot on its heels, leading ever onwards and into the dawn of a rapidly changing world of the 1990s. The Eade family were probably little different to most, but luckily left behind detailed surviving records that provide some insight into their lives, deaths, families, aspirations and trials. Although some assumptions and conclusions have been drawn to try and colour in the various players and the events that affected them, this account is hopefully reasonably accurate and supported throughout by various records and the work of other historians as acknowledged. At times the events recorded must have been joyous but as ever when ultimately dealing with death the overall direction must always veer towards sadness, but then isn't that just life? Andrew John Eade was born at his Grandmother's house; "Orion", The Priory, Leominster in January 1954. His family moved to Wellington in Shropshire during 1955 where he was educated and set down roots. Having attended the local Grammar School he served an engineering apprenticeship and worked for several local companies before jointly starting a successful business in 1988. Andrew still lives in Shropshire and is the father of three girls; Gemma, Victoria and Beatrice. He has been a Local Authority Councillor continuously since 1983 and an ex-Leader of the Borough of Telford and Wrekin Unitary Council. Roberta (Robyn) Lane was born in London, Ontario Canada and is the eldest child of Bob and Ivey Spicer (Ivey is the daughter of John Beck and Edith Eade). She spent her life growing up in a Naval Military family moving from one coast of Canada to the other, which is an education in itself, and then continuing that way of life when she married her husband Ken. Retired from secretarial work, and living in Sackville, Nova Scotia, Robyn now happily spends her time digging through and piecing together the family's history; a legacy she lovingly leaves to her daughter Taryn and her grandchildren.